I’m pretty much a self-professed spice hoarder, so Penzey’s almost makes me as happy as Nordstrom does. Seriously, it’s pretty close. Last week I was making a recipe for an upcoming post and thought it needed a little kick in autumnal flavor department. Since apples are the star ingredient, it only seemed natural to whip up a batch of Homemade Apple Pie Spice. As soon as the air turns crisp and leaves start to turn, I get into serious Fall baking mode and in my opinion there’s no better aroma than Fall spices like ginger, cinnamon and cardamom. Sure you can pick up a jar of Apple Pie Spice from your local market, but making your own is simple and it will save you a few bucks since I’m betting you have most of the ingredients on hand. By making your own spice blends, you can also tweak the amounts and customize the blend to meet your taste. Love cardamom? Add a little more in, I promise – you really can’t mess it up! I love throwing apple pie spice into apple pie (of course), but it’s also great in any dessert that you want to add a little bit of warmth and depth to. Think baked apples, oatmeal, apple muffins and so much more! I like to store my spice blends in Weck jars, but really, any jar or bottle will do. You can even wash, dry and reuse old spice jars making it even more economical! 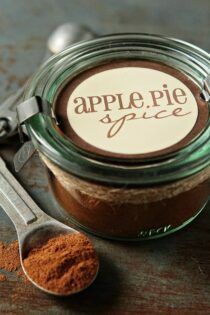 If you’re crafty, I think a cute label and a little twine could make homemade apple pie spice the perfect little gift for fall. Couple the spice blend with a basket of freshly picked apples and you have a great holiday gift for neighbors, co-workers, friends and family. These measurements don’t need to be precise. If you prefer more of one spice or less of another, feel free to adjust to your liking. 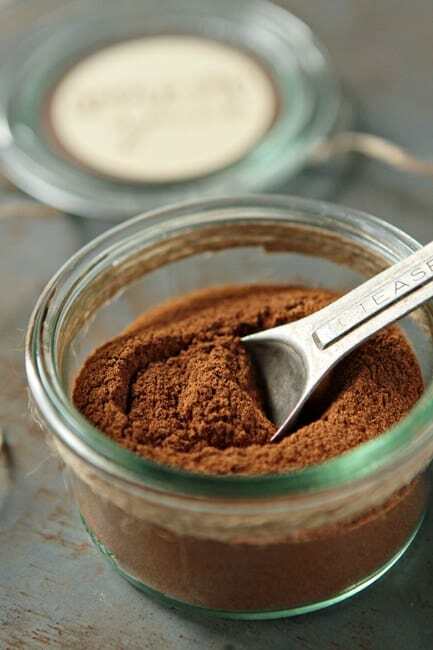 If using freshly grated nutmeg, you’ll want to decrease the amount a bit as it tends to be be quire a bit stronger than jarred, ground nutmeg. The Weck Jar in the photo is the 976-165 Mini Mold Jar. I used my Silhouette Cameo to create the label. The fonts used are Pharmacy and Liorah.